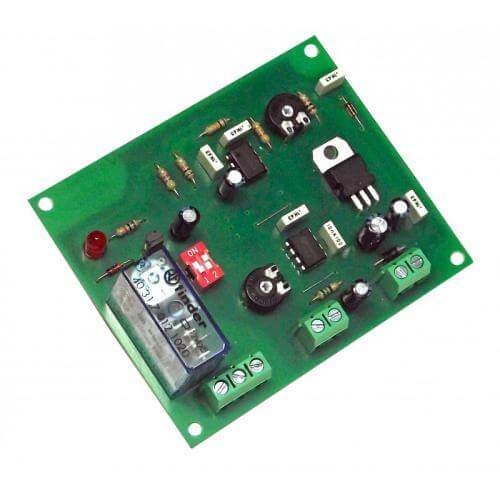 Voltage increase detection module (16-28Vdc) with a mains rated relay output. Simply place in parallel with the power supply to be monitored. The relay output activates when the voltage rises above the trigger level (user adjustable from 16 to 28Vdc using onboard trimmer). The output relay can be set to activates on a timer (adjustable from 1-5 seconds) or latching on with manual reset. The board is reverse polarity protected. Screw terminal blocks for all connections. Model CI172 offers a detection range from 7 - 18V dc. Current Consumption 15mA min. - 60mA max.